Objectives Vagus nerve stimulation (VNS), most likely via enteric neurons, prevents postoperative ileus (POI) by reducing activation of alpha7 nicotinic receptor (α7nAChR) positive muscularis macrophages (mMφ) and dampening surgery-induced intestinal inflammation. Here, we evaluated if 5-HT4 receptor (5-HT4R) agonist prucalopride can mimic this effect in mice and human. Design Using Ca2+ imaging, the effect of electrical field stimulation (EFS) and prucalopride was evaluated in situ on mMφ activation evoked by ATP in jejunal muscularis tissue. Next, preoperative and postoperative administration of prucalopride (1–5 mg/kg) was compared with that of preoperative VNS in a model of POI in wild-type and α7nAChR knockout mice. Finally, in a pilot study, patients undergoing a Whipple procedure were preoperatively treated with prucalopride (n=10), abdominal VNS (n=10) or sham/placebo (n=10) to evaluate the effect on intestinal inflammation and clinical recovery of POI. Results EFS reduced the ATP-induced Ca2+ response of mMφ, an effect that was dampened by neurotoxins tetrodotoxin and ω-conotoxin and mimicked by prucalopride. In vivo, prucalopride administered before, but not after abdominal surgery reduced intestinal inflammation and prevented POI in wild-type, but not in α7nAChR knockout mice. In humans, preoperative administration of prucalopride, but not of VNS, decreased Il6 and Il8 expression in the muscularis externa and improved clinical recovery. Conclusion Enteric neurons dampen mMφ activation, an effect mimicked by prucalopride. Preoperative, but not postoperative treatment with prucalopride prevents intestinal inflammation and shortens POI in both mice and human, indicating that preoperative administration of 5-HT4R agonists should be further evaluated as a treatment of POI. Vagus nerve stimulation (VNS), most likely via enteric neurons, prevents activation of muscularis macrophages (mMφ) resulting in fastened recovery of GI function in a murine model of postoperative ileus (POI). Alpha7 nicotinic receptor (α7nAChR) expression on the resident mMφ is essential for the induction of this cholinergic anti-inflammatory pathway in the gut. 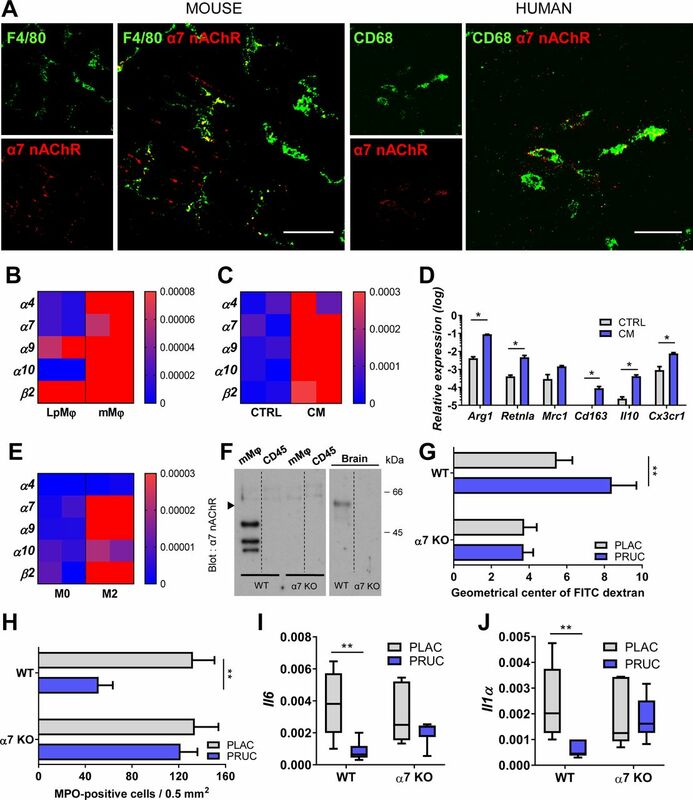 Supernatant of myenteric ganglia cultures imprints a tolerogenic phenotype and induces the expression of nicotinic acetylcholine receptors in bone marrow-derived macrophages. Electrical and pharmacological activation of enteric neurons modulates ATP-induced Ca2+ response in intestinal mMφ. Similar to VNS, the 5-HT4 receptor (5-HT4R) agonist prucalopride, a compound known to enhance neurotransmitter release from enteric neurons, prevents mMφ activation and reduces POI, but only if administered prior to surgery. This anti-inflammatory effect is mediated via the α7nAChR. In a clinical pilot study, we showed that also in human prucalopride administered before abdominal surgery has anti-inflammatory properties and improves postoperative recovery in human. Our study shows that enteric neurons exert an inhibitory effect on mMφ activation and indicates that preoperative activation of this pathway by prucalopride, or perhaps other 5-HT4R agonists, should be further explored as treatment of POI in clinical care. Most likely, the lack of effect of prokinetics can be explained by the insight that intestinal handling during surgery triggers the activation of resident muscularis macrophages (mMφ) leading to inflammation of the intestinal muscle layer with influx of mainly monocytes and neutrophils.5–7 This inflammatory process is associated with impaired contractility of intestinal smooth muscle strips to cholinergic agonists in vitro and reduced intestinal transit in vivo.5–7 Administration of prokinetics in the postoperative period is therefore likely to be ineffective. Of note, however, interventions that prevent surgery-induced intestinal inflammation have been abundantly shown in preclinical models to restore GI motility. In line, POI is significantly shortened in mice lacking resident mMφ, such as op/op and clodronate-treated mice, indicating that mMφ represent an important target to shorten POI.8 9 In previous studies, we confirmed this concept and showed that electrical stimulation of the vagus nerve (VNS) prior to surgery reduced surgery-induced inflammation and prevented POI in a preclinical model.10–12 This anti-inflammatory effect was mediated by acetylcholine (ACh) acting on α7 nicotinic receptors (α7nAChR) located on mMφ.12 Vagus nerve endings however do not directly interact with mMφ, but rather synapse with enteric neurons in close proximity to mMφ.13 Hence, we proposed that the therapeutic effect of VNS in POI most likely results from cholinergic enteric neurons dampening mMφ activation. In the present study, we aimed (1) to provide further evidence supporting this hypothesis and (2) to explore the therapeutic properties of pharmacological potentiation of this enteric neuron-mediated anti-inflammatory pathway both in mice and human. To pharmacologically potentiate neurotransmitter release from enteric neurons, we used the selective 5-HT4R agonist prucalopride (PRUC), known to enhance the release of both cholinergic and excitatory non-adrenergic non-cholinergic neurotransmitters from enteric neurons,14 15 and used as a treatment of constipation. This compound has recently been evaluated as treatment of POI in two clinical trials with no or a small effect. In both studies, however, PRUC was administered after surgery when the contractile properties of the inflamed intestine are known to be compromised. Based on our previous work, we anticipated that to be effective, PRUC should be administered prior to surgery to stimulate the enteric neuron-mediated anti-inflammatory pathway. In the present study, we therefore first evaluated to what extent electrical and pharmacological stimulation of enteric neurons is indeed able to dampen mMφ activation in vitro. Next, we compared the efficacy of preoperative and postoperative administration of PRUC with that of VNS in a model of POI and evaluated the anti-inflammatory properties of preoperative administration of PRUC and abdominal VNS in patients undergoing abdominal surgery. Please see online supplementary materials for an expanded version of this section. Experiments were performed using female wild-type (C57BL/6JOlaHsd), α7nAChR knockout (KO), CX3CR1GFP/WT and Wnt.1GCaMP3 mice, which were bred and housed in the specific pathogen-free environment of the animal facility (KU Leuven). Based on a protocol published by Grundmann et al 16, myenteric ganglia were isolated from the small intestine of naive female wild-type mice aged 8–10 weeks. Briefly, the jejunal muscularis externa was peeled from the mucosa and digested with Liberase TH and DNase I for 30 min at 37°C after which individual myenteric ganglia were identified and collected using a stereotactic microscope to perform gene expression experiments. Jejunal muscularis externa was peeled and enzymatically digested at 37°C in Alpha MEM medium (Lonza) containing 5% fetal bovine serum (FBS) (Biowest), 100 µg/mL penicillin (Lonza), 100 µg/mL streptomycin (Lonza), 5.5 µM beta-mercaptoethanol (Gibco), 250 µg/mL collagenase IV (Sigma-Aldrich), 500 µg/mL protease I (Sigma-Aldrich) and 5 U/mL DNaseI (Roche) shaking at 120 RPM for 1 hour and trypsinised with 0.25% Trypin/EDTA (Invitrogen) at 37°C for 15 min. Single cell suspension from the jejunum was seeded on coverslips coated with 0.1% poly-D-lysine (Sigma-Aldrich) and 20 µl/mL laminin (Sigma-Aldrich) and cultured in neurobasal-A medium (Gibco) supplemented with 10% FBS, 100 µg/mL penicillin, 100 µg/mL streptomycin, 0.2% G5-supplement (ThermoScientific), 50 ng/mL nerve growth factor (NGF) 7 s (Alomone) and 10 µM cytosine β-D-arabinofuranoside (Sigma-Aldrich), an antimitotic agent which reduces fibroblasts and glial cells enriching neurons in the primary cultures. Fifty per cent of the medium was refreshed every 3 days until day 9. At the 11th day of culture, fresh neurobasal-A medium supplemented only with 2% serum replacement (Sigma-Aldrich), 100 µg/mL penicillin and 100 µg/mL streptomycin was added to the myenteric ganglia culture. After 24 hours (12th day of culture), the supernatant (conditioned medium (CM)) was collected and stored at −80°C until further use. One day prior to the experiment, bone marrow-derived macrophages (BMDM; cultured as previously published17; see online supplementary materials) were seeded at 106 cells/mL in neurobasal-A medium containing 2% serum replacement, 100 µg/mL penicillin and 100 µg/mL streptomycin. The day of the experiment BMDM were incubated with CM collected from myenteric ganglia cultures or with control medium (neurobasal-A medium) containing 2% serum replacement, 100 µg/mL penicillin and 100 µg/mL streptomycin for 24 hours after which cells were rinsed with ice-cold dulbecco’s phosphate buffered saline (D-PBS); Lonza) and collected for gene expression analysis. For the polarisation of naïve BMDM (M0) into M2-type BMDM, we treated the naïve BMDM with 20 ng/mL interleukin (IL)4 (Peprotech) for 24 hours. Total RNA was extracted from isolated ganglia, BMDM (M0 and M2); and sorted lamina propria macrophages (LPMφ) and mMφ (see online supplementary materials) using the Rneasy Plus micro kit (Qiagen) and retrotranscribed by qScript cDNA SuperMix (Quanta Biosciences). The primers used are listed in online supplementary table 3). The expression levels of the genes of interest were normalised to the expression levels of the reference gene rpl32. For the randomised placebo-controlled pilot study, 42 patients were recruited at the University Hospital of Leuven between July 2014 and February 2016. Of these 42 patients, 30 completed the study and were analysed (figure 4B). Patients older than 18 years with confirmed or suspected neoplasms of the pancreas, ampulla Vateri or periampullary region undergoing an open pancreaticoduodenectomy were eligible. Patients were screened for the following exclusion criteria at the time of surgery: intra-abdominal inflammation, pregnancy, preoperative radiotherapy, chronic pancreatitis without suspected malignancy and uncontrolled diabetes (200 mg/dL). All patients were randomised in a 1:1:1 ratio to the SHAM/PLAC, VNS or PRUC group according to a computer-generated block randomisation list without stratification. The allocation sequence was generated by an independent pharmacist (University Hospital of Leuven) and was not available to the research team except for one clinical trial nurse (KV) operating the nerve stimulation during surgery. Placebo and PRUC packaging was identical and executed by the University Hospital of Leuven Pharmacy. After inclusion, the identity of the patients was encoded according to the European Union guidelines, that is, a unique number was used (hospital patient number) coupled with a unique case report form (CRF) number. Only the principal investigator had access to the list of participating subjects (hospital patient number) and the corresponding unique CRF number. The patients were treated with 2 mg PRUC (16 and 2 hours prior to surgery), abdominal VNS (2 min, 20 Hz, 2.5 mA, 1 ms at the start and end of the surgical procedure) or placebo (16 and 2 hours prior to surgery). Patients allocated to placebo or PRUC received sham stimulation at the start and end of surgery, patients treated with abdominal VNS received placebo. Abdominal VNS was performed as previously described (see online supplementary materials).11 19 An elaborate treatment protocol is also provided in online supplementary table 1. The primary end point was the reduction in surgery-induced upregulation of pro-inflammatory genes in duodenal muscularis tissue. In more detail, the local anti-inflammatory effect was determined in duodenal tissue taken at the start and 2 hours into the surgical procedure. As secondary end points, clinical recovery was assessed by the time of nasogastric tube (NGT) removal, volume of stomach output on postoperative day 3, time to first solids, first defecation and time to discharge. The daily assessment of clinical recovery was performed by an experienced trial nurse. The nurses and treating physicians on the ward were not informed about the given treatment. The study was registered at clinicaltrials.gov (NCT02425774). All patients gave their written informed consent prior to their participation to the study. Normality, differences in variance and the presence of outliers were determined via the Shapiro-Wilk test, Levene test and Grubbs’ test, respectively prior to statistical analysis. Two-way analysis of variance (ANOVA) followed by Bonferroni post hoc test was performed to compare multiple groups and multiple variables. To compare multiple groups and a single variable, one-way ANOVA or Kruskal-Wallis test was performed followed by Bonferroni or Dunn’s post hoc test, respectively. To compare two independent groups and a single variable, the unpaired t-test or Mann-Whitney U test was performed depending on normality. To compare categorical variables the Χ2 test was used. With respect to the pilot study, no previous data on changes in cytokine expression in human intestinal muscularis were available. Therefore, we arbitrarirly chose 10 patients per group to investigate the anti-inflammatory properties of VNS and preoperative administration of PRUC. Patients were excluded from the analysis of clinical recovery if they developed an abdominal infection (ie, positive culture of certain bacterial or fungal strains in abdominal drainage fluid) (SHAM/PLAC: n=1; VNS: n=3 and PRUC: n=3). This exclusion criteria was predefined based on previous publications20 showing that the occurrence of an abdominal infection is strongly positively correlated with prolonged postoperative gastroparesis and ileus. For the gene expression of the human muscularis tissue, one patient in the PRUC group was excluded, as this person was a severe outlier using the Grubb’s outlier test (α=0.05). Probability level of p<0.05 was considered statistically significant. Graphpad Prism software was used to perform statistical analysis. Previously, we reported neuromodulation of mMφ in a murine model of POI,21 that is, VNS dampened the mMφ activation and prevented intestinal manipulation-induced muscular inflammation. This effect is however indirect and most likely mediated via cholinergic enteric neurons, as not vagal terminals but enteric nerve fibres contact mMφ.21 As shown in figure 1A, also in human, cholinergic enteric fibres are in close proximity to mMφ. To further prove this hypothesis, we evaluated to what extent electrical stimulation of enteric neurons indeed modulates mMφ activation. Using mice expressing the genetically encoded Cre-dependent Ca2+ sensor (GCaMP3) in enteric neurons (Wnt.1GCaMP3 mice), we first confirmed frequency-dependent activation of enteric neurons by electrical field stimulation (EFS) in an in situ preparation of jejunal muscularis tissue (figure 1B). Next, we studied the effect of EFS on mMφ stimulated with ATP, a typical tissue damage-associated molecule. EFS significantly reduced the amplitude of the ATP-induced Ca2+ signal and increased the number of maximally inhibited mMφ (figure 1C–E). Tetrodotoxin, a compound blocking the generation of action potentials in neurons, reduced the inhibitory effect of EFS (figure 1D–E). Similar effects were obtained using ω-conotoxin, a blocker of voltage-gated Ca2+ channels, predominantly expressed in nerve terminals, where they control neurotransmitter release,22 further supporting the neuronal origin of the inhibitory effect of EFS (figure 1D–E). Cholinergic enteric neurons modulate resident muscularis macrophages. (A) Muscularis externa whole mount from the jejunal tissue of wild-type (WT) mice was stained for choline acetyltransferase (ChAT)-positive enteric neurons and F4/80-positive muscularis macrophages (mMφ) (left panel). Muscularis externa whole mount from human small intestinal tissue was stained for CD68-positive mMφ and ChAT-positive enteric fibres (right panel). Scale bars are 50 µm. (B) Upper panel shows representative images and tracing of enteric neurons in the jejunal muscularis of Wnt.1GCAMP3 mouse before stimulation (no stimulation (NS)) and during electrical field stimulation with 1, 5 or 20 Hz (EFS; pulse width: 1 ms, current: 20 mA). Scale bar is 10 µm. (C) Representative images from a Fluo-4 loaded mMφ in the jejunal muscularis of CX3CR1GFP/WT mouse in response to 100 µM of ATP before and after EFS (20 Hz; pulse width: 1 ms, current: 20 mA). Scale bar is 20 µm. (D–E) Effect of Krebs (CTRL), EFS, EFS+tetradotoxin (TTX; 10 µM), EFS+ω-conotoxin (0.1 µM) or 150 µM of prucalopride (PRUC) on ATP-induced mMφ activation, expressed as mean decrease in Ca2+-induced amplitude (D) and as percentage of mMφ maximally inhibited (E) for n=74–100 mMφ. Data are from 4 to 7 animals/condition. *P<0.05, **p<0.01. One-way analysis of variance with Bonferonni post hoc test (D) and two-tailed χ² test (E). (F) 5-HT4R expression in sorted mMφ, isolated ganglia and whole mount muscularis tissue. (G) Maximum intensity projection of confocal stacks showing muscularis externa whole mount from the jejunum of WT mice was stained for 5-HT4R, ChAT and F4/80. Next, we evaluated the effect of the selective 5-HT4R agonist PRUC on mMφ activation in whole mount muscularis preparations. As shown in figure 1D,E, incubation with PRUC mimicked the effect of EFS. These data suggest that neurotransmitters released by enteric neurons modulate mMφ activity. Of note, although we applied a higher dosing of PRUC in these in situ experiments than previously described in literature,15 23 this concentration did not affect pro-inflammatory and anti-inflammatory cytokine expression in lipopolysaccharide (LPS)-stimulated BMDM (data not shown), argueing against a direct effect of PRUC on Mφ. 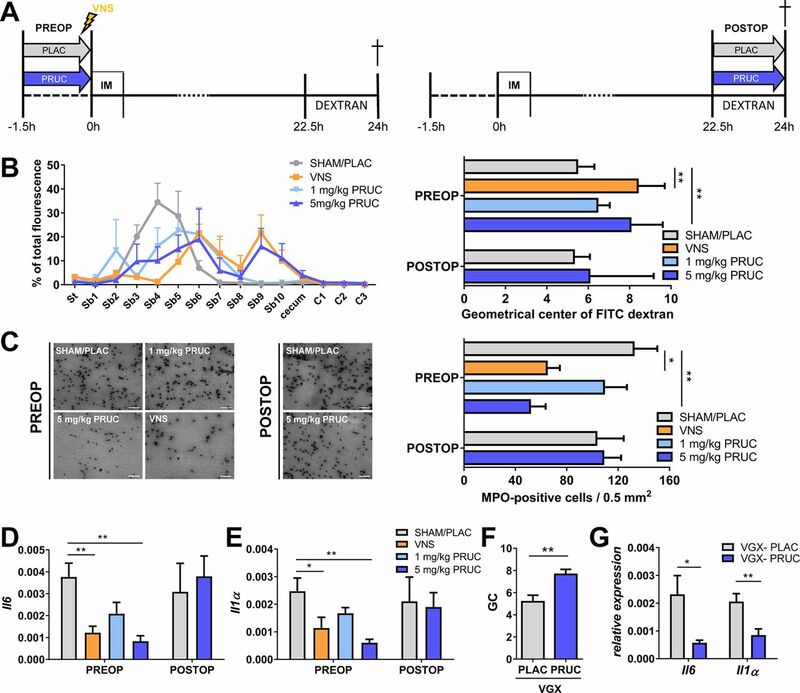 To further confirm that PRUC is truly acting on the enteric neurons, and not directly interacts with mMφ, the expression of 5-HT4R was assessed in sorted mMφ, isolated enteric ganglia and muscularis tissue using real-time quantitative PCR. 5-HT4R expression was not detected in sorted mMφ, but was abundantly present in isolated enteric ganglia and muscularis tissue (figure 1F). This was confirmed in immunohistochemical stainings of muscularis tissue. Submucosal and myenteric neurons were 5HT4R positive, but not the mMφ. Interestingly, F4/80-positive mMφ were found in close proximity to cholinergic enteric fibres expressing 5HT4R (figure 1G). To further exclude a direct effect of PRUC on macrophages (Mφ), LPS-stimulated whole blood of healthy volunteers was pretreated with PRUC. No effect on IL6, IL8 or tumour necrosis factor (TNF)-α release was observed (see online supplementary figure 1), further excluding this possibility. Although cervical VNS effectively reduces intestinal inflammation and shortens POI in preclinical models,10 21 24 this approach is invasive and stimulation parameters in human still require optimisation. Moreover, vagal innervation declines in density along the intestinal tract and fails to innervate the distal colon, making this approach less attractive for clinical application. As we showed that PRUC dampens mMφ activation, we asked whether it can mimic the effect of VNS in vivo and subsequently prevent POI. As with VNS, PRUC was administered prior to surgery in order to precondition mMφ. As shown in figure 2, preoperative administration of 5 mg/kg PRUC, similar to VNS, reduced intestinal inflammation, that is, cytokine expression and influx of inflammatory cells (see online supplementary figure 2, figure 2A–E). 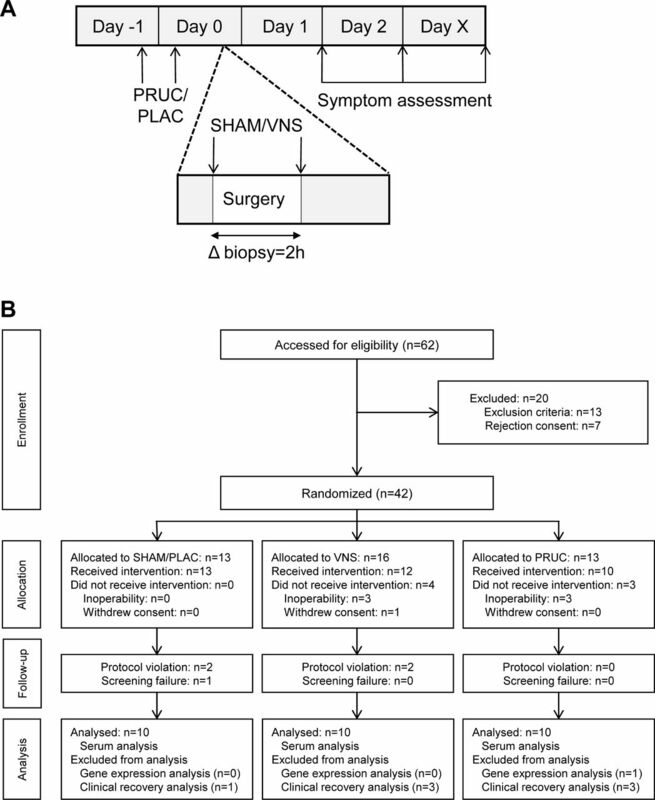 Moreover, intestinal transit assessed 24 hours after surgery was restored in mice pretreated with PRUC or VNS compared with SHAM/PLAC stimulation (figure 2B). Vagotomy did not affect the anti-inflammatory effects of PRUC (figure 2F–G), indicating that PRUC acts directly on the intestine. Notably, PRUC, administered 24 hours after surgery did not reduce intestinal inflammation and failed to restore intestinal transit (figure 2A–E). Taken together, these data indicate that PRUC has anti-inflammatory properties, but only when administered before surgery, and effectively reduces POI. Pharmacological activation of enteric neurons reduces intestinal inflammation and improves postoperative ileus. (A) Schematic representation of experimental protocol. 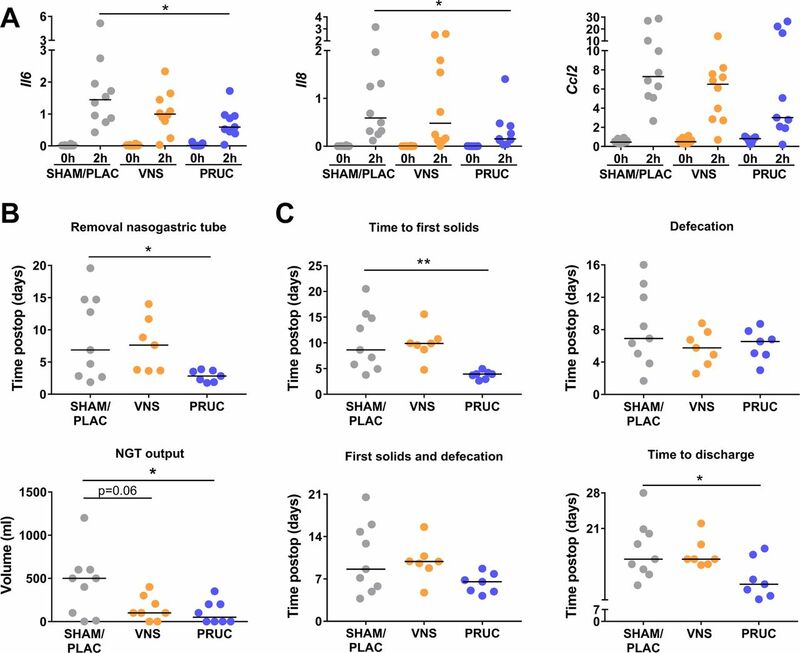 Mice subjected to intestinal manipulation (IM) were treated with vagus nerve stimulation (VNS) or prucalopride (PRUC; oral gavage 1.5 hour prior to or 22.5 hours after IM) and compared to sham/placebo (SHAM/PLAC) . Fluorescently labelled dextran was gavaged 22.5 hours after IM and mice were sacrificed 1.5 hours later. Geometrical centre (GC) of dextran distribution was used to quantify the GI transit. (B) Dextran distribution through the GI tract (left panel) and GC (right panel) for each group of mice. St, stomach; Sb, small bowel; C, colon. (C) Representative image (left panel) and number of myeloperoxidase (MPO)-positive cells/0.5 mm2 (right panel) in jejunal muscularis. Scale bars are 50 µm. (D–E) Relative mRNA levels for Il6 and Il1α normalised to the housekeeping gene rpl32 from jejunal muscularis tissue. (B–E) Data are expressed as mean±SEM from n=6–10 mice/group. *P<0.05, **p<0.01. One-way ANOVA with Bonferonni post hoc test for PREOP and unpaired t-test for POSTOP. (F–G) Vagotomised (VGX) mice treated with PLAC or PRUC 1.5 hours prior to IM. (F) Bar graph represents the mean GC 24 hours after IM. (G) Mean of relative mRNA levels in the jejunal muscularis for Il1α and Il6 normalised to the housekeeping gene rpl32. *P<0.05, **p<0.01. Unpaired t-test for VGX-PLAC vs VGX-PRUC. n=6–8 mice/group. As we previously demonstrated that the anti-inflammatory effect of VNS is mediated by α7nAChR,21 24 we next evaluated its role in the effect of PRUC. First, we determined the expression of α7nAChR using immunohistochemical stainings. As shown in figure 3A, α7nAChR was expressed in both murine and human intestine. To confirm this finding, expression of α7nAChR in sorted mMφ was compared with that of isolated lamina propria Mφ. As shown in figure 3B, α7nAChR was only expressed in isolated mMφ. Cholinergic modulation of muscularis macrophages (mMφ) is mediated by alpha7 nicotinic acetylcholine receptor (α7nAChR). (A) Maximum intensity projection of confocal stacks showing small intestinal muscularis whole mount tissue stained for α7nAChR (red) on F4/80-positive muscularis macrophages (mMφ; green) in a wild-type (WT) mouse (right panel) and on CD68-positive mMφ (green) in human (left panel). Scale bars are 20 µm. (B) Heatmap of nAChR subunit expression in sorted lamina propria macrophages (LpMφ) and mMφ. (C) Heatmap of nAChR subunit expression in naïve bone marrow-derived macrophages (BMDM) incubated with conditioned medium (CM) collected from myenteric ganglia cultures or control medium (CTRL). (D) Bar graph of anti-inflammatory gene expression of naïve BMDM incubated with CM collected from myenteric ganglia cultures or CTRL. Data are expressed as mean log10 ± SEM. *P<0.05. Unpaired t-test. n=3-5/experiment. (E) Heatmap of nAChR subunit expression in BMDM (M0) and polarised M2 BMDM. (F) Western blot analysis of sorted mMφ and sorted muscularis immune cells (CD45+CD11c-IA/IE-CD64-CD11b-) purified on α-bungarotoxin affinity column (α7nAChR). Brain extracts are from WT and α7nAChR knock-out (KO) mice. (G–J) α7nAChR KO mice were treated with either placebo (PLAC) or prucalopride (PRUC) 1.5 hours prior to intestinal manipulation (IM). (G) Bar graph represents the GC values for each group 24 hours after IM. (H) Bar graph represents the number of MPO-positive cells/0.5 mm2 24 hours after IM. (G–H) Data are expressed as mean±SEM. **P<0.01. Unpaired t-test. n=6–8 mice/group. (I–J) Relative mRNA levels in jejunal muscularis for Il1α and Il6 normalised to the housekeeping gene rpl32. Data are expressed as median with 5–95 percentile whiskers. **P<0.01. Mann-Whitney U test. n=6–8 mice/group. As mMφ were reported to have a M2-like tolerogenic phenotype,25 we next evaluated to what extent enteric neurons contribute to this phenotype and instal the expression of α7nAChR. To this end, BMDM were incubated with conditioned medium of primary myenteric ganglia cultures. As shown in figure 3C–D, conditioned medium induced the expression of α7nAChR and installed a M2-like phenotype, as indicated by the upregulation of Arg1, Retnla, Cd163, Il10 and Cx3cr1. Of note, also IL4-differentiated BMDM expressed α7nAChR, suggesting that M2-like tissue Mφ may be under neuronal modulation (figure 3E). Finally, we performed western blot analysis of murine intestinal immune cells lysates with affinity purification on an α-bungarotoxin (α-Bgtx)-sepharose column (figure 3F). No α7nAChR signal was observed in the CD45+ population devoid of mMφ, while three bands were detected in the α-Bgtx purified mMφ lysate of wild-type mice. Of interest, the molecular weight differed from the α7nAChR isolated from the brain and the predicted 56 kDa.26 27 The bands detected were absent in α7nAChR KO mice, confirming the specificity of the antibody used. To the best of our knowledge, this is the first specific western blot analysis of mMφ-α7nAChR, suggesting that the α7nAChR in mMφ differs from its neuronal counterpart, although proteolysis during the purification cannot be excluded. Next, we studied the effect of PRUC in our POI model using α7nAChR KO mice. Of note, PRUC failed to improve intestinal transit (figure 3G) and did not reduce the number of myeloperoxidase (MPO)-positive cells (figure 3H), or Il6 and Il1α expression (figure 3I–J) in the muscularis. Taken together, these data indicate that the anti-inflammatory effect of PRUC, similar to VNS, is mediated by α7nAChRs. We next aimed to translate our preclinical data to patient care. Therefore, we designed a placebo-controlled pilot study comparing PRUC (n=10), abdominal VNS (n=10) and SHAM/PLAC treatment (n=10) in patients undergoing a pancreaticoduodenectomy (figure 4A–B). The demographic and clinical characteristics of all groups were similar except for male gender, which was higher in the PRUC group (see online supplementary table 2). Previous studies, however, demonstrated that gender did not have a clinical relevance on postoperative outcome.20 28 29 The current patient population was selected based on high incidence of POI and the long duration of the surgical procedure allowing us to detect changes in pro-inflammatory gene expression in the muscularis. Indeed, 2 hours after the start of the surgical procedure, the pro-inflammatory genes Il6, Il8 and Ccl2 were significantly upregulated in the intestinal muscularis tissue (figure 5A). Of note, PRUC significantly reduced Il6 and Il8 expression in the muscularis, while VNS tended to reduce Il6 compared with SHAM/PLAC treatment. The serum levels of IL6, IL8 and TNF-α were not affected by PRUC or VNS (see online supplementary figure 3). (A) Patient flow chart. (B) Schematic overview of study protocol. PLAC, placebo; PRUC, prucalopride; VNS, vagus nerve stimulation. Preoperative administration of prucalopride reduces intestinal inflammation and improves postoperative ileus in human. (A) Relative mRNA levels in the muscularis externa for Il6, Il8 and Ccl2 normalised to the housekeeping gene c10fr43. Duodenal tissue was taken at the beginning of the procedure (0 hour) and 2 hours into the surgery (2 hours) for patients treated with sham/placebo (SHAM/PLAC), abdominal vagus nerve stimulation (VNS) or prucalopride (PRUC). Data are expressed as mean±SEM *P<0.05. Repeated two-way analysis of variance (ANOVA) with Bonferroni correction for multiple testing; n=9–10 patients/group. (B) Time until removal of nasogastric tube (NGT) (upper panel) and the NGT output on postoperative day 3 (lower panel). (C) Other clinical (secondary) end points (ie, days until tolerance to first solids, first defecation, combination of time to tolerance to solids and first defecation and days until discharge) for SHAM/PLAC-treated, abdominal VNS-treated or PRUC-treated groups without site-specific complications (SSC). (C) NGT output data on postoperative day 3 is expressed as median±interquartile range for SHAM/PLAC-treated, abdominal VNS-treated or PRUC-treated groups without SSC. *P<0.05. Kruskal-Wallis test with Dunn’s test for multiple comparison test; n=7–9 patients without SSC/group. (B–C) The other dot plots are expressed as mean±SEM *P<0.05, **p<0.01. One-way ANOVA with Bonferroni correction for multiple testing; n=7–9 patients without SSC/group. As shown in figure 5B–C PRUC, but not VNS, significantly reduced the time to removal of the NGT, NGT output and time to first solids. In more detail, there was a wide spread in the aforementioned clinical parameters in the SHAM/PLAC-treated group. In contrast, the NGT output was below 350 mL at day 3 in all PRUC-treated patients as opposed to 3 and 6 in the SHAM/PLAC-treated group and VNS-treated group, respectively. In line, the NGT was removed within 4 days in all PRUC-treated patients compared with three patients in the SHAM/PLAC group and three in the VNS group. In line, all PRUC-treated patients tolerated solid foods by day 5 in contrast to only two and one patient in the SHAM/PLAC group and VNS group, respectively. No difference in time to first defecation was observed between the three different groups. Of note, all PRUC-treated patients tolerated solids and had their first defecation by day 9, as opposed to only five and two patients in the SHAM/PLAC group and VNS group, respectively. Finally, time to discharge was significantly reduced from 15.0 (12.5–20.5) days in the SHAM/PLAC group to 10.5 (8.0–15.5) days in the PRUC group (figure 5C). Taken together, our data show that preoperative administration of PRUC has anti-inflammatory properties in human, as shown by the downregulation of pro-inflammatory cytokines in the intestinal muscularis, and leads to a faster postoperative clinical recovery. In the present study, we provide in vitro evidence that enteric neurons, either stimulated electrically or via administration of PRUC, can dampen mMφ activation. In vivo, PRUC administered prior to, but not after surgery mimicked the effect of VNS in a murine model of POI. Finally, in a pilot study, we showed that also in human, administration of PRUC prior to a Whipple procedure has an anti-inflammatory effect, and improves clinical postoperative parameters. Collectively, these data provide further evidence supporting the concept that enteric neuron potentation exerts an inhibitory input to mMφ and indicate that preoperative activation of this pathway by PRUC, or other 5-HT4R agonists, should be further explored as treatment of POI. The intestine is densely populated with enteric neurons, organised into the myenteric and submucosal plexus, mediating a variety of physiological processes such as intestinal motility, secretion and control of blood flow. Only recently, it has become clear that myenteric neurons are critically important for the maintenance of mMφ by secretion of colony stimulatory factor 1, a growth factor required for mMφ development.25 30 Here, we provide further evidence that enteric neurons communicate with mMφ and can dampen their activation in response to ATP. 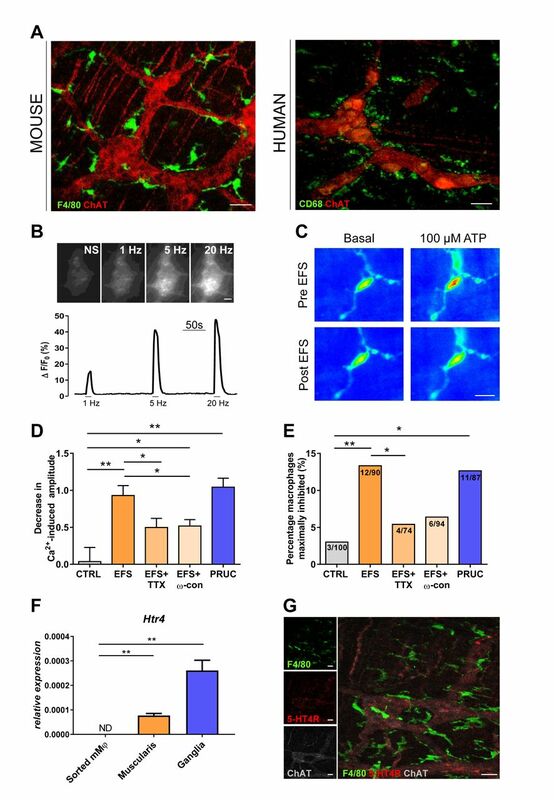 Using an experimental set-up in which mMφ can be studied in their natural environment, we showed that electrical stimulation of enteric neurons reduced the ATP-induced Ca2+ response in mMφ, previously shown to be coupled to cytokine secretion.31 This effect was dampened by the neurotoxins tetrodotoxin and ω-conotoxin, indicating that the reduction in the mMφ response to ATP resulted from neuronal activation. Although the exact nature of the neurons involved was not identified, our previous work demonstrating that 1) the anti-inflammatory effect of VNS is mediated by α7nAChR, 2) both nicotine and the α7nAChR agonist choline also dampen mMφ activation by ATP and 3) cholinergic fibres are in close contact with mMφ, are all indicative that mMφ are modulated by cholinergic neurons via α7nAChR.12 Of interest, α7nAChR expression was restricted to mMφ and M2-type BMDM and could be induced by conditioned medium of myenteric ganglia, further providing evidence that enteric neurons communicate with mMφ and modulate their function. Although identification of the neuronal mediators involved requires further study, one can speculate that this process may be crucial to facilitate the inhibitory input of ACh to mMφ. The ‘mMφ-α7nAChR’ by which this inhibitory effect is mediated seems to differ from the ‘classical neuronal α7nAChR’, as shown by the different molecular weight. Another important finding of our study is the observation that administration of PRUC after surgery is devoid of an anti-inflammatory effect and fails to restore GI transit. Indeed, PRUC administered 22.5 hours after surgery had no significant effect on intestinal inflammation and transit. These data would argue against the use of prokinetics to improve intestinal motility in the postoperative phase, especially as the contractile potential of the inflamed intestine is compromised. In previous clinical trials, prokinetics have always been administered in the postoperative phase with rather disappointing results. Erythromycin, metoclopramide, cisapride3 or ghrelin receptor agonists4 all failed to improve POI. Two studies with mosapride started on 1 day after surgery showed reduction in time to first defecation and improvement of solid food intake, but these trials were small (n=30–40) or single blinded.35 36 Of particular interest in view of our findings, two studies have evaluated the effect of PRUC in patients undergoing colorectal surgery, showing no effect on hospital stay37 or a reduction from 8 to 7.38 In both studies, treatment was continued for 3–7 days but was only started the day after surgery. Based on our preclinical data, one would argue that patients should be pretreated with PRUC prior to surgery in order to dampen the inflammatory response in the muscularis evoked by abdominal surgery. To evaluate this novel approach in human, we designed a pilot study in patients undergoing a Whipple procedure. This surgical procedure was chosen in view of its long duration allowing the detection of upregulation of inflammatory genes, such as Il6, Il8 and Ccl2, as previously reported.7 Although we recently reported a reduction in IL8 and IL6 production by whole blood in patients who underwent abdominal VNS,11 no effect was noted on gene expression in the muscularis externa of the VNS group. In contrast, expression of both Il6 and Il8 was significantly reduced in the PRUC-treated patients, compared with SHAM/PLAC treatment. With only 2 times 2 mg of PRUC administered prior to surgery, clinical parameters were significantly better in the PRUC group. Nasogastric output and its time of removal and time to tolerance of solid food were significantly reduced compared with the other groups. Although no strict criteria were defined a priori to discharge patients, hospital stay was significantly shorter (approximately 5 days) in the PRUC-treated group compared with the SHAM/PLAC-treated group. To what extent the clinical parameters assessed in our pilot study would have been even more improved if PRUC treatment was continued after surgery remains to be studied. Obviously, as our clinical study is only a pilot study and not powered for clinical parameters, these data should be interpreted with care. Nevertheless, together with the preclinical data, our study indicates that preoperative administration of PRUC, and perhaps also other 5-HT4R agonists, dampens the inflammatory response triggered by abdominal surgery, and leads to faster clinical recovery. Besides this protective, anti-inflammatory effect of PRUC, activation of 5-HT4R also possesses neuroprotective properties in the intestine, both in vitro and in vivo,39–42 further underscoring the therapeutic potential of 5-HT4R agonists in the treatment of POI. Based on the data provided, pharmacological management of POI should be changed considerably, that is, clinicians should reconsider administering prokinetics only in the postoperative period in an attempt to stimulate gut motility. Instead, patients should be treated with 5-HT4R agonists like PRUC prior to surgery to prevent mMφ activation and intestinal inflammation. Our study sets the stage for future clinical trials evaluating the effect of 5-HT4R agonists starting prior to surgery. The authors would also like to thank R Mols, I Terrasson, B Topal and the nursing staff (Oka1, E447 and E906) of UZ Leuven for their excellent technical assistance. Confocal imaging (LSM880: AKUL/15/37 - G0H1816N to PVDB) and calcium imaging were performed at the Cell Imaging Core (KU Leuven, Belgium). Cell sorting and flow cytometry was done at the FACS core facility (KU Leuven, Belgium).
. Novel method for studying postoperative ileus in mice. Int J Physiol Pathophysiol Pharmacol 2012;4:219. NS, EL and PJG-P contributed equally. GM and GEB contributed equally. Contributors NS, EL, PJG-P, KT, GM and GEB planned and designed experiments. NS, EL, PJG-P, GF, IA, EM, MS, MFV, GB, EG-D, YAA, PA, SD, GG, EW, RD, AW, RA, ADH, KV, SV, MM, CG, MV, KT and PVDB performed or supervised the experiments. NS, EL, PJGP, GM and GEB reviewed data and wrote the manuscript. All other authors corrected and approved the final version of the manuscript. Funding This work was supported by the European Research Council (ERC) Advanced Grant (ERC-2013-Adg: 340101 Cholstim) to GEB. GEB is also supported by Flanders Fund for Innovation by Science and Technology (IWT-TBM; 110699), and Research Foundation—Flanders (FWO): Odysseus programme (G.0905.07) and two FWO grants (G.0566.12N and G.0890.18N). NS, PJG-P, YAA, GG, SV and GM are supported by a postdoctoral research fellowship of FWO. GM is supported by an FWO grant (G.0D83.17N) and by KU Leuven grants (ZKD2906-C14/17/097 and ZKC9531-C12/15/016). Ethics approval This study was approved by KU Leuven Animal Ethics Committee and Medical Ethics Committee UZ KU Leuven.